Today is Day Two of my Unity Stamp Company Growing in Unity week of posts. Today I have a shaker card to share. I'll even give you a few of my quick hacks for assembling the shaker portion of a card. I know I shouldn't have a favorite stamp. It's kind of like being asked which child is your favorite. They are all amazing and lovely in their own way, so it's impossible to choose one, right? Well, for the most part yes. But I do have a favorite Unity Stamp Company Itty Bitty stamp. And I used it today to create my project. Today I stamped him onto Hammermill Color Copy Digital Cover paper using Memento ink and my Original MISTI. I then began to prep the front of my shaker card. When I make a shaker card front, I prefer to trim the panels AFTER I've die cut the window. I think that gives me more flexibility and less room for error. I added a piece of clear window plastic with liquid glue to the back of my card stock and set it aside to dry. Next I used the same die to cut two pieces of purple self-adhesive craft "fun foam". I like to use fun foam rather than foam tape because it's inexpensive, and forms a very sturdy shaker. Since this foam is rather thin, I'm going to use a double layer to give enough depth so the sequins don't get stuck, and can "shake" easily. Like previously, I die cut from larger-than-needed pieces, so I could trim them to size AFTER I had lined them up and adhered them together. I adhered the non-adhesive sides together using Scor-tape, leaving the adhesive sides ready to peel and stick to the card base and the card front panel. I use a liberal amount of Scor-tape to adhere them together. I completely surround the opening with tape to keep any sequins from slipping in between the layers. Since the die cut openings of the fun foam and the opening on the card front are exactly the same size, I want to line them up perfectly. at certain points on the inside of the opening. These pins allow me to lower the top layer down onto the adhesive by sliding along the pins to assure perfect alignment. Now I can trim the layered fun foam to fit just 1/8" inside the front panel and adhere. Now it's time to go back to Alfie and color him. I am using Copic Markers today. I darkened the eyes using a Copic Multi liner pen, then added white dot highlights with a white gel pen. I then added just a small pile of sequins, and removed the adhesive from the back of the fun foam and gently lowered the assemble shaker frame over the top, carefully lining it up. I didn't want to add too many sequins, or they would cover Alfie when the card stands. I used to piece of Duralar to create a cheat sheet for lining up my sentiment onto my banner. I stamped onto the clear plastic, then moved the banner into place beneath it, positioning it in the perfect location and securing it with a bar magnet. I then removed the plastic sheet and stamped in Versafine Black Onyx ink and heat embossed with clear embossing powder. Then I adhered it to my assembled shaker with liquid glue, wrapping the remainder around and behind the shaker. All that was left was to adhere it to my top fold A2 card base! I hope you find a few of these shaker hacks useful when you make your next shaker card. Drop me a comment here. If you do, you will be entered to win one of two prize packs of 25 random Unity Stamps donated by Unity Stamp Company to celebrate my GIU week. Winners will be chosen from all comments left during the week, and will be posted on the Unity Stamp Company Show and Tell Facebook page as well as on this blog in the next weeks. Thanks for stopping in today! Come on back tomorrow for Day Three! I love Alfie - he's my favorite mouse too! Thanks for all of the great shaker tips. Alfie is so cute and this is a great shaker card. Good tip for the craft foam. I snatched several large sheets of it on clearance at Hobby Lobby and have been waiting to use it for something like this. Thank you for sharing! I've been wanting to try making a shaker card and was honestly was just now wondering what would be a good stamp to use. I have Alfie! Thanks again! I love Alfie too! You did an amazing job coloring him. Beautiful! Such a fun card! Love him. Super sweet card! This card is adorable! Beautiful coloring. Loving your step by step walk thru to make your shaker card. I have tried to make a few with epic failures. I will try your technique. Thank you! I love this mouse stamp! I use him for all kinds of cards. Thanks for your helpful tips for this shaker card. Great technique! Love your card. The coloring of your mouse is so awesome! Fun foam is the best! Great idea to use it for a shaker. Alfie is one of my favorites too. He’s so sweet! Cute card! I didn't know you could get self adhesive fun foam (and in colors!) Where have I been?! That was one thing I didn't care for when I made shaker cards for the first time - seeing the white foam tape on the edges made it look "unfinished" to me. Thanks, Chris! Awe that mouse is so cute and I love your great tips for making a shaker card! I LOVE this technique! I can't wait for tomorrow!!!! This mouse is the cutest! Your mouse shaker card is so adorable. I love the die cut and the sequin colors you chose to go inside the shaker. Love it! Super sweet. Great tips. Thanks for the inspiration! Alfie is sooo adorable!!! Thanks for the great tip, will certainly use that!! Your coloring is just fabulous!! I love this little mouse! This card is sweet, thank you for all the useful tips! WOW, your coloring skills are great. I LOVE THIS LITTLE GUY! I love Alfie! Other than Mickey... he’s my favorite mouse! I love the way you colored him! Very cute, I made one shaker card. It turned out meh! But I like the heart idea. I never made a shaker card but will definitely keep these tips in mind! Love how you colored Alfie (I adore him, he’s so cute!). So cute with the mouse and the heart shaker. Your ability to reflect light in coloring and shading is exceptional! Your shaker card is adorable! Adorable!! I love Alfie too, he is so cute. Thank you for sharing this shaker technique! aww, isn't this a sweet card. Cute card. I love the mouse, he is on my wishlist. Darling shaker card! Love that mouse! Love this sweet adorable little mouse. You did a great job. Super cute! Great fun foam tips for shakers. 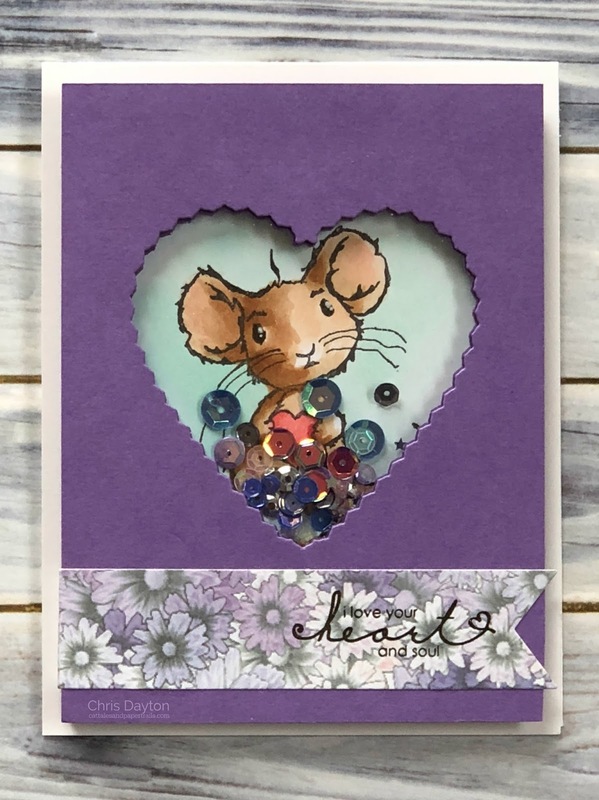 Love your mouse coloring! How cute is this little mouse ! !